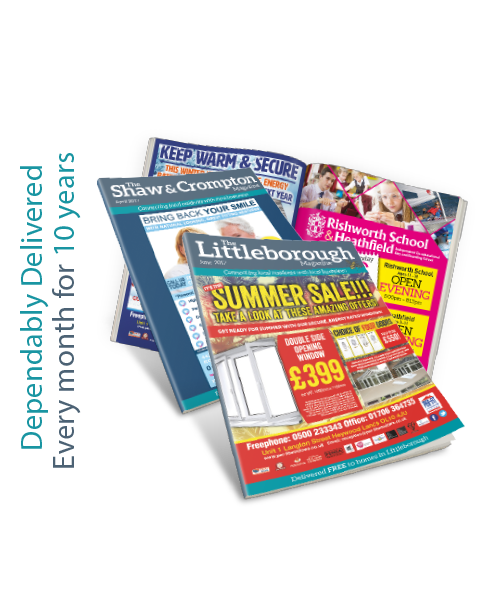 The Littleborough & Shaw Magazines Ltd. use a database to hold information from the enquiry web form when our customers enquire about our magazines. As this information is used to follow up your enquiry it is technically stored. Under the new GDPR guidelines we are required to safely store this information. In order to process your enquiry you have to tick the Opt-In Consent box. • Never pass this data onto a third party. • Keep safely your acknowledgement of consent for as long as GDPR guidelines require. • You can write to us at any time to have a copy of your personal data we hold on our systems or request us to remove it. Enquiry SelectionAdvertising EnquiryAdd an EventSubmit an ArticleAdd a PhotoGeneral Enquiry Please tell us how big is your company. Under the new GDPR guidelines we must have your consent in order to process your enquiry. We can assure you that we will NEVER share your info with anyone. Check out our Data Policy page. Yes, I am happy for you to process my enquiry. Please tick box to give your consent to send us your personal data, enabling us to process your enquiry. © 2018 Littleborough & Shaw Magazines Limited. All Rights Reserved.